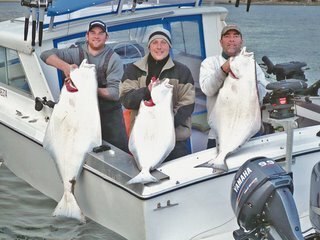 With halibut fishing opening March 1st, the fishing effort around Sooke and Victoria has switched away from salmon. hatchery marked chinook greater than 67 cm fork length. wild chinook (unmarked) or hatchery marked between the size limit of 45 cm and 67 cm fork length. So, that means local anglers can keep larger hatchery salmon, but for wild salmon can only keep the smaller ones, between 18" and 27". On the halibut front, many reports of limit catches from Jordan River to Oak Bay. 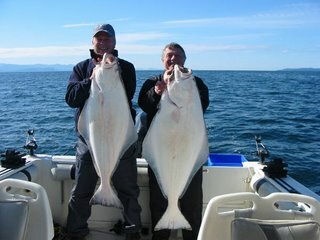 Gord from Foghorn Fishing Charters provides this picture and report: "This is the first halibut day of 2009 in Victoria waters, Joe on the left and his good friend Brian on the right. Joe is a Vancouver Island local and Brian is from Ottawa, they each are holding 40lb fish. These are their first halibut ever caught...and they are both planning to do it again!" Constance Bank is said to be a hot spot, with Trevor from No Bananas Fishing Charters reporting two good days this week. First day -- "put the gear down at 7 and we were back the dock by 830, both were on herring in 200ft of water". Second day: "non-stop action, brought 10 to the boat ... nothing very big but the guests had fun!" Steve Arnett of Kiwi Magic provides the following report in the Sooke News-Mirror: "“Stick and stay make’s it pay,” the old saying in these parts for a successful day on the water. As was the case Sunday for these anglers from Sooke. Albert hold’s up two nice hali’s caught west of Sooke. While Ryan, Adam and Bob show off their catch of halibut caught fishing Constance Bank in Victoria. Patience is the practice for a successful day of hali fishing, you spend hours waiting for a bite and wam in half an hour you’re done, heading home with a hali of a smile on your face. Until next time. Keep your rod tip up! Kiwi Magic "
The air is a bit chilly, but the sun is out...put out the anchor and chase a nice flat fish!